Please start your 2016 & continue with 2017 posts here . . . Thank you, Bev! I also miss having a cam here. Took a break from the office to check out 77 Beale. I first spotted what I thought was an adult pancaked on top of the parapet in the 2nd bay from the right on the south side facing Mission St. 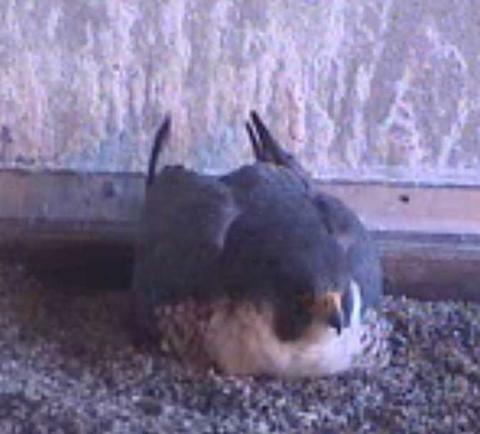 However, checking the Main St side I clearly spotted two adults perched on the top floor windows. 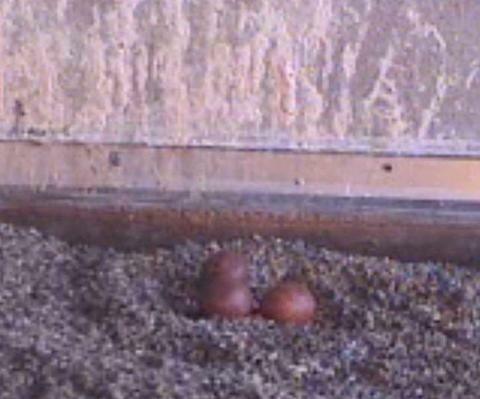 Either we have 3 birds on the building, or the one pancaked flat is large prey. Was unable to stick around to watch for movement. Anyone with some free time could check this out with a pair of binoculars. well, Glenn has talked t0 PG , where cam is and they are going to se what can be done. WE will see, but it looks like we have a pair here. I get lots of emails of activity and not sure what I can share but Glenn shares what he can. Thanks for posting this Maggie, and to you Rob for covering the technical side. All of this remains essentially true, but I DID have a conversation with a PG&E IT manager yesterday revealing that they at least have an interest in making some sort of camera image available on some basis. As I said last year, there are many barriers. Believe me, I have looked into this, examined the technical issues, and considered the costs. The fact that there is institutional willingness at PG&E to do "something" is a big step in the right direction. 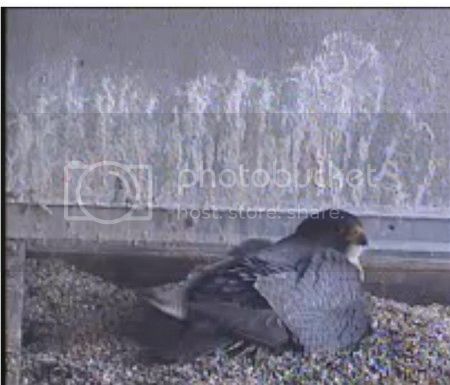 The fact that there is a pair of copulating falcons on the ledge is another positive factor. 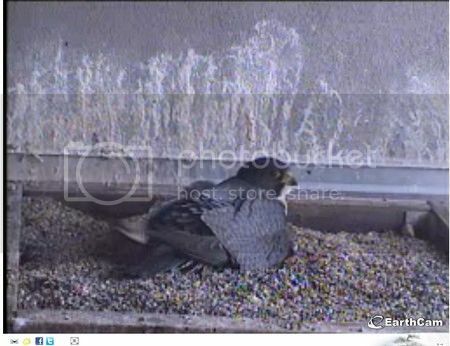 That people are letting PG&E know that they want to see the birds is important (I reminded the IT guy yesterday that those falcons are often the only good news coming out of that building!) While I have never seen a screen capture or any other evidence, PG&E claims they can still get an image from the camera. Making that image (generated by old technology) available to the viewing public is a whole other matter. But let's let the IT guys look at that and see what they can do. the good news is that if they--after all this time--can indeed do something using the camera now in place means that there is "potential" to see something this year. I hesitate to get everyone's hopes up unnecessarily but my way has always been to simply let you know what I know. 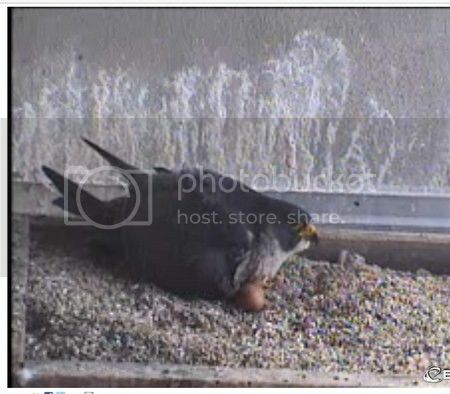 All best, --Glenn Stewart, UC Santa Cruz Predatory Bird Research Group. Thanks for posting that info, Bev! I won't get my hopes up, but we can always use a pleasant surprise! OK Folks - hang on to your chairs. 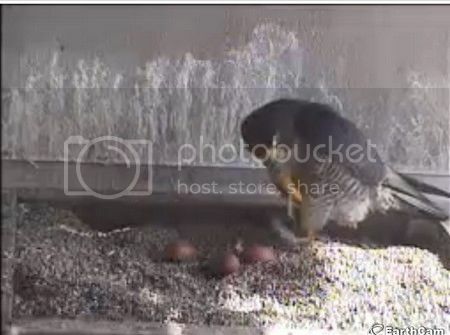 The new falcon at PG&E has three eggs so far. Since we don't know her history she could have a forth. Also - Glenn Stewart just let me know that "the camera may be operational in just a few days". I am not sure how the feed will be accomplished and will let everyone know how to access the feed when I find out. This is all I know at present and Glenn is out in the field, so we need to exercise patience. Thanks to all in the many departments at PG&E who worked on this effort. I was just coming to post . I wonder if we can tell if one is same as a few years ago. In my opinion it is still Cher and Dan. I watched Cher so much that year. Bev - I agree with you... I think it is Cher too!